AKSamba had the pleasure of playing for our friends Pirate City Rollers at the Roller Derby finals between Dead Wreckoning and Alpha Beta Slammers. This event was held at the YMCA on July 16 and was sold out days in advance. 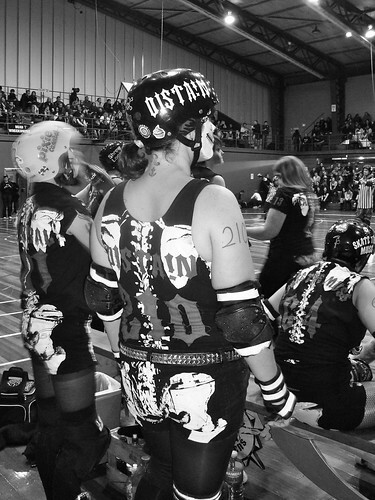 AKSamba loves Roller Derby! Feeding off the good vibes and positive energy from the fabulous ‘up for it’ crowd, AKSamba played a short punchy halftime set that included material we have been working on with Mestre Fred from London School of Samba. Well organized and a great gig to play, thanks to Pirate City Rollers and the Roller Derby crowd. You ROCK! Well done Alpha Beta Slammers, who won the Black Dahlia Cup in the final seconds. Congratulations to Chris and Margo who made their AKSamba performance debuts and also Mandar for his second only gig. Chris, Margo and Mandar joined the AKSamba fun after attending one of our workshops. We played at the Wings Of Hope fundraiser for the Japanese earthquake appeal on May 8th. We arrived at a sunny Aotea Square to the sounds of Haere Mai Taiko Drummers and thought it would be a great idea to ask them if they wanted to play along with AK Samba. They loved the idea and played along for our whole set of 5 tunes, which we all enjoyed. There were plenty of people watching and the collection buckets were rattling with cash. This is the first time there has been a samba/taiko collaboration in New Zealand, and maybe the first time ever in the world. AKSamba will be performing at Jambalaya Festival. This is a fabulous weekend festival filled with music, dance, food, activities, and is being held in West Auckland for the first time. Have a look at www.jambalaya.co.nz for more info.